It’s late when I finally find the courage to move, test out my legs, my erstwhile stomach. 7:15. I’m an achy mess, and looking at food makes me nauseous again, so I opt to skip the oatmeal and poptarts in lieu of a Snickers1. I down another liter and a half of water as I pack up a tent wet from last night’s rain, make my way down to the South Platte for more sustenance. It’s 9am by the time I treat my water, choke down poptarts in spite of myself, and make my way uphill again. The climb is more intense today – or, at least, between the altitude, my tiredness, and the 4.66 liters of water I’m carrying to the next source 13 miles up, it feels that way – and I’m still dehydrated from the night before. I have to pee what feels like every thirty seconds, and I wish my body would retain at least some of the water. Especially since it’s a burnt-out section: there’s not a lot of cover to shield oneself from passing mountain bikers. The change in the landscape feels like I’ve traveled a lot more than 6.8 miles by the time I decide to stop for lunch at the top of today’s climb, stare daggers at my food, eventually eat. I have more stomach for draining the small blister on my right pinky toe with a needle and floss than I do for the almonds and trail mix I packed myself. The trail opens up into a prairie-ish area, and I’m thankful for the intermittent clouds and wonderfully-spaced pine trees shielding me from the worst of the sun. It’s a beautiful trek, all rolling hills and wildflowers I didn’t expect to see this late in the season. Towards the end of the prairie, I find an emergency water cache – I don’t need it, the next water source is three miles up and I have a liter and a half left, but the kindness makes me tear up. Folks who go out of their way to help others leave me in awe. 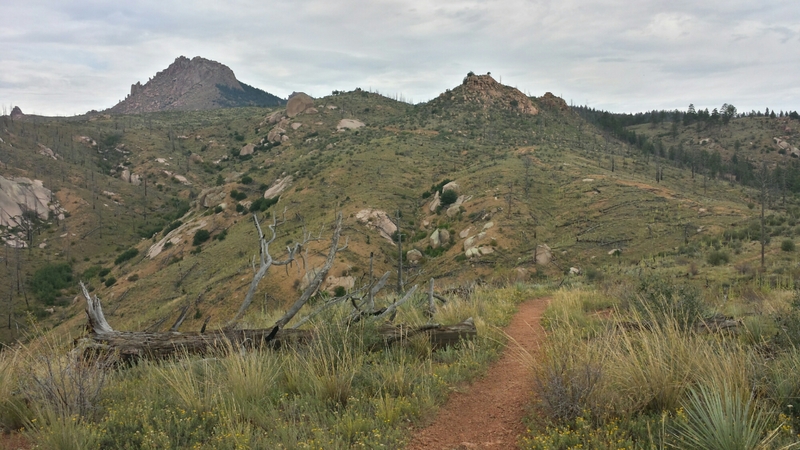 I cross my first paved road, make it to the end of Segment 2 at the Little Scraggy Trailhead, and meet a father and two sons from Colorado Springs who are thrus, too. We chat a short while, I use the privilege of peeing behind the walls of the trailhead toilet, and I keep moving. I get to a creek at the base of a hill, and my everything says no. Nope. Not going up that. Not tonight. And, with said hill between me and the evening sun, the light’s already fading. And my stomach is screaming again, though I can’t tell if it’s from hunger or exhaustion. So, in a not-at-all LNT-friendly move, I set up camp as far as I can from the creek, which is only about 50 feet, and I promise to rough up the area when I leave to make my transgression a bit less obvious to others. I cook mac and cheese for the second night in a row – I figure it’ll be gentle enough on my rowdy insides – but as soon as I finish and put some olive oil in it to beef up the calories, the smell triggers my gag reflex. I’m not eating tonight. The perfectly good meal ends up in a cathole with the remains of the last meal I ate, and, gloomily munching on a clif bar, I make a promise to eat “dinner” in the morning. Don’t look to me for answers on that one. It made sense to my stomach at the time. I was getting a liiiittle loopy at that point. Thank you for presenting this blog! Especially because you sound so lively, verbal, articulate and have very good spelling and apostrophe usage. Those last two may seem petty but it’s easier to respect your obvious intelligence and enthusiasm when you are thoughtful enough to be careful with the language. (Also must respect George Bernard Shaw for proposing that the apostrophe be dropped from English because it is such a confusing pain.) Also great to see your fine photos and to have another woman thoroughly documenting her own solo heavy-duty hiking (Carrot Quinn suggested your blog). Finally you deserve yet more praise for showing high-quality presentation and long-distance hiking are not white monopolies. More power to you!